A few weeks into my new life as a stay at home mom I came to a sad realization. I had honestly thought that because I was home more and not working that the house would be soooo clean. You see, instead of just having evenings and weekends to do household chores, I'd have all day! Right? Except I didn't quite realize that being home all day also meant making messes all day. Especially with a toddler who takes baby feeding times as a opportunity to get into everything she can. It was a sad moment when I realized that keeping the house clean would be just as hard or harder than before. It was a similar realization when it came to making dinner. I still need fast dinner recipes with minimal prep because even though I'm not starting dinner after I get home at five, I'm still running around the kitchen like a mad woman getting everything prepped when it comes to dinner time because I'm fitting meal prep in between feedings, book reading and putting bandaids on various invisible ouchies. This tortilla bake is the latest favorite for fast dinners. The prep time is minimal, especially if you started with already shredded, cooked chicken. I'm a fan of the little hands on time, but also of the ricotta and spinach layers. 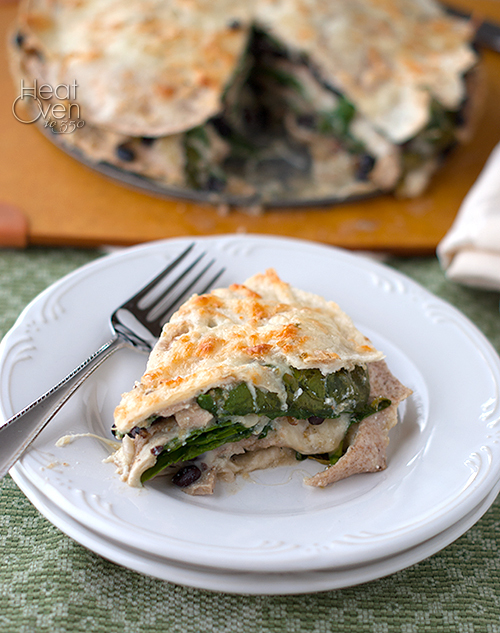 The ricotta gives the tortilla bake a creaminess that reminds me of lasagna, but with a twist. The spinach, although it seems like a lot when you are putting the layers together, cooks down to nice, soft layers that add an earthy (in a good way) taste to the chicken, cheese and tortillas. I'm not much of a fan of raw spinach, but cooked spinach is my friend. The whole dish gets a slight tanginess from the salsa verde that I love. If you aren't a fan of salsa verde you could substitute regular salsa but the taste will be completely different and lose its uniqueness. You can control how spicy this dish is with the salsa verde you choose and the ratio of pepperjack cheese to monterey jack. You can also make this a little healthier by subbing in whole wheat tortillas for all or part of the tortillas in the recipe. It's such a versatile, delicious dish you will almost forget that you put it together while talking on the phone, nursing a baby, and playing stuffed animal soccer with your toddler. Heat oven to 450 degrees. Place a large skillet over medium-high heat and heat olive oil until shimmering. Slice chicken breasts in half and season with salt and pepper. Add chicken breasts to skillet and cook, turning once, until cooked through. Let cool slightly and shred. In a medium bowl, whisk together salsa verde and ricotta. Add just enough of the salsa verde mixture to cover the bottom of a 8 or 9 inch springform pan. Top with 1/4 of the torn tortillas, then 1/3 of the chicken, black beans, spinach, a heaping 1/2 cup of the salsa verde mixture and 1/3 of the cheeses. Repeat layers, ending with a final layer of tortillas and cheese on top. Cover springform pan with foil and bake 15 minutes. Remove foil and bake another 10-15 minutes or until cheese has browned. Remove from oven and let stand for 10 minutes before separating the springform pan and cutting into slices. I work from home and my kids are teenagers and out of the house all day, but I still like easy and quick dinner recipes. Totally takes the pressure off at the end of the day! 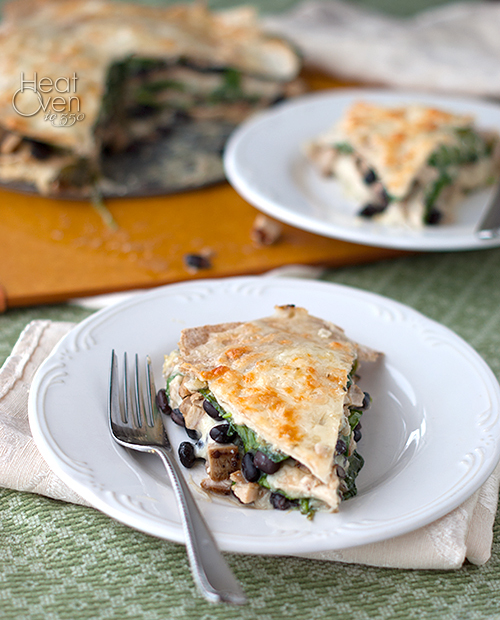 This tortilla bake looks divine! I've never used ricotta cheese in anything Mexican before. Bet it makes it super creamy! Have a great weekend! This dinner looks great. Anything with tortillas and cheese is going to be one of my favorites. Can't wait to try it! I'm not a new mom (yet) but I'm still always looking for no-fuss dinner recipes. I know this one would totally be a hit in my house. Definitely getting made this week!